Oscar Wilde famously declared, “I have the simplest tastes. I am always satisfied with the best.” For well-heeled travelers who share Wilde’s sentiment, Manhattan’s Theatre District has a must-stay hotel for you. A 5-star luxury landmark seeped in art deco glamour, The Chatwal has established itself as “the” hotel of choice for glitterati and the visiting artistic elite, since its fall 2010 opening. Originally the home of America’s first theatrical society, ‘The Lambs’, the edifice was designed in 1904 by Lambs Club member, Stanford White, ranked as one of the era’s iconic architect. 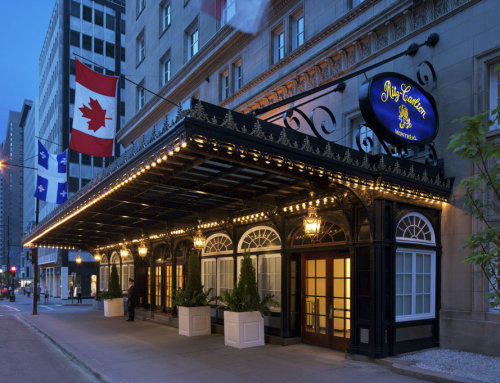 Blending old New York glamour with modern art deco charm, this 83-room hotel, transports guests back to the city’s Golden Age. A pleasant stroll away from attractions adored by locals and tourists alike, guests of the hotel need only mere minutes to arrive at popular destinations including Broadway theatres, Times Square, Central Park and the heavenly shops of 5th Avenue. For hungry shoppers, the area offers a wide choice of quick bites from Central Park’s famed “roadside” burger joint, Shake Shack (save room for the frozen custard) to the iconic Russian Tea Room for those who are just looking for a “simple” (à la Wilde that is) place to grab a bite of N.Y smoked sturgeon with dill and sour cream, washed down with a spot of tea, before heading back to their plush suite. Or skip the hopping about and go back to hotel, set down your bags and begin the unwinding process with a vintage cocktail at The Lambs Club Restaurant, where Chef Geoffrey Zakarian’s menu of modern takes on American classics meld seamlessly with the bar and grill’s relaxed atmosphere. Inspired by the hotel’s original art deco sensibility, Master Architect and Designer, Thierry Despont, carries over White’s vision into the modern design of guest suites, seen in the pebbled leather encasing the rooms’ closets and desks, reminiscent of travel trunks aboard a steamship in the early 20th century. Tugging at the nostalgia of its décor, suite goodies to occupy one’s self with are anything but the usual magazines (also available) ranging from a backgammon set, a pack of old-fashioned playing cards and books such as The Great Gatsby — the latter being the perfect companion for a soak in the ensuite Jacuzzi. Mad Men enthusiasts traveling to the city to celebrate a special occasion would do well with booking The Stanford White Studio for the event. Originally serving as the club library, the entire room has been delicately refurbished and reinstalled, complete with the original oak wood paneled walls and beams, a granite fireplace with a rich detailed wood mantle, and a fully furnished private outdoor terrace, making it the ideal space to enjoy friends and a greyhound or two. If the luxury of private butlers and 400 thread-count linens isn’t enough to complete your vision of luxury, Spa Chatwal — with its three treatment rooms, private changing suites featuring steam showers, relaxation lounge with quentching spa aperitifs, saltwater lap pool plus two plunge pools offering hot and cold therapy, and manicure and pedicure studio — will most certainly do it. The Chatwal has all the comforts of home for visiting creatures of comfort.